Performers include: Jack Wild, Billie Hayes, Lennie Weinrib, Joan Gerber, Walker Edmiston, Sharon Baird, Roberto Gamonet, Joy Campbell, Angelo Rossitto, Johnny Silver, and Felix Silla. This fantasy children’s series, created by puppeteers Sid and Marty Krofft, follows the adventures of a young boy named Jimmy (Jack Wild). While playing near a river with his talking flute named Freddy (voiced by Joan Gerber), he’s promised a great adventure and is beckoned onto a boat owned by an evil witch, Wilhelmina W. Witchiepoo (Billie Hayes). With the wave of her wand, the boat attacks the Jimmy. He fights back and falls overboard with Freddy in tow. They wash up on the shore of the bizarre Living Island and are rescued by its Mayor, a friendly dragon named H.R. 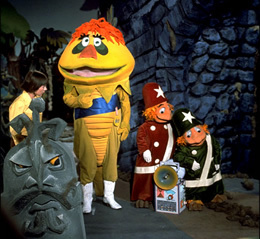 Pufnstuf (voiced by Lennie Weinrib). Pufnstuf is aided by his pair of Rescue Rangers; Cling (voiced by Joy Campbell) and Clang (voiced by Angelo Rossitto). On this strange island, Jimmy is amazed to find that nearly everything is alive; the houses, the clocks, the trees, and even the books. But he isn’t out of danger. With the help of Pufnstuf, Jimmy realizes that Witchiepoo is after Freddy and she’ll do whatever it takes to add the magic flute to her collection of trophies. Witchiepoo arrives via her Vroom Broom with her dimwitted henchmen in tow; Seymour Spider (Weinrib) and Orson Vulture (voiced by Walker Edmiston). Thankfully, Jimmy finds refuge in Pufnstuf’s cave, the place where Witchiepoo’s magic is useless. The boy knows that he can’t stay on Living Island forever and, with the help of Pufnstuf and citizens like Ludicrous Lion (voiced by Johnny Silver) and Dr. Blinkey (Weinrib), he tries to find a way to safely return home with Freddy.